You Live and Learn (Apparently) is Bates’s first CD for six years. The title and the artwork have a back-to-school theme: mugshots of his musicians are grafted onto figures in blazers and ties, while the liner notes are in crossed-out handwriting. It endorses an impression Bates often gives, that he views art as a form of knock down ginger in which he rings the doorbell of every piece of received aesthetic wisdom and then runs like hell. The approach has gained Bates a considerable reputation in contemporary music circles, as a skilled and appealing maverick who can play world-class jazz keyboards when he fancies, knows enough about straight music to give classical soloists something interesting to do, and has an anarchic wit that can make the most uncompromising, disruptive music palatable. The reaction of jazz fans, on the other hand, can be mixed. Some welcome his improviser’s relish for stubbornly avoiding the thing that’s supposed to come next. Some wish he would stick to one good idea for long enough to let its implications bloom. But, give or take some exceptions – notably My Way – there’s more patient blooming than is usual for Bates on this adventurously sophisticated set. 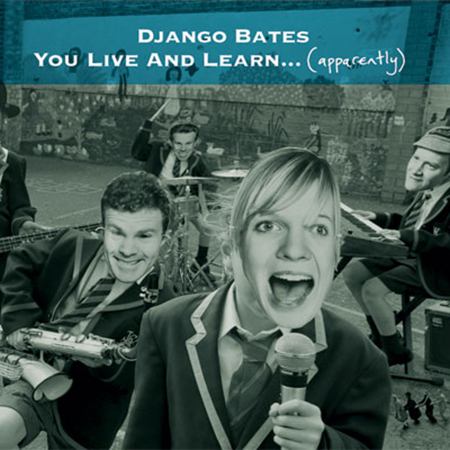 You Live and Learn (Apparently) goes back to where Bates was when he last recorded, on the left-field standards album Quiet Nights: releasing the barely fluttering breeze of Josefine Lindstrand’s fragile voice, using a song-based repertoire, and a small jazz group of mates, including saxophonist Iain Ballamy and drummer Martin France. But Bates has broadened the palette this time, to include the Smith string quartet and two heavyweight jazz guests: Scottish guitarist Jim Mullen and American soul-sax star David Sanborn. Mullen plays a lot, though Sanborn’s inimitable signature turns up only in brief high-register wails deep in the mix in a version of David Bowie’s Life on Mars. Unlike Quiet Nights – which really did concentrate on the standard song, albeit mangled in places – this is a far more representative spread of Bates’s enthusiasms. On the title track, Lindstrand (formerly Josefine Cronholm) hums privately to herself before a soft funk groove opens out to support the supple lines of saxophonist Iain Ballamy, who is excellent throughout. It’s a soul-pop song stretched by Bates’s zigzagging melody, by the mellow variations of Ballamy’s sax, and by Jim Mullen’s guitar, floating over a 1960s soul-jazz big-brass sound. A multi-tempo version of My Way has a bouncing Chick Corea Latin-jazz piano vamp. Eventually it is replaced by Lindstrand’s plaintive, more or less straight, account; the Latin feel comes back and wins out in the end, though, with Ballamy’s tenor careering through it. This is typical Bates stop-start tempo-teasing. Bowie’s Life on Mars might well prove a hit with its originator: it’s a dramatically building ensemble piece with Lindstrand’s voice staying limpid and clear through a growing turmoil, though David Sanborn fans might be disappointed by how cursory his intervention is. Sidsel Endresen’s lyrics for the whimsical Horses in Rain complement a very still and simple melody, often on a single note, but periodically given an eerie ecclesiastical descending resolution, like a priest intoning a psalm. There’s a Weather Report shower-of-sound feel to From Chaos, Anything Is Possible before its swoony, Hollywood-love-story climax, with Bates’s son Archy tentatively reading a passage on the origins of the universe. Then back come Ballamy and Mullen, a combination that sounds worth exploring a lot further, intertwining over a hip-hop groove. Bates provides his own version of the Young Person’s Guide to the Orchestra by getting a children’s choir to sing a song about musical intervals – the kind of ingenuous intervention that will have detractors leaping for the off switch, but that might even find itself on a syllabus one day. “Around each corner is a new mistake,” go the lyrics of the title track, “simply much too good to miss.” Bates could hardly have summed up his position more perfectly. Doing the wrong thing at the right time is his forte, and for his regular admirers, and listeners looking for a new hit, this personal and elegant piece of style-shuffling has a lot on its side.